The classic sock monkey toy is redesigned in a pop up Jack-in-the-Box that is sure to surprise and delight any little one. 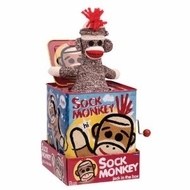 The crank handle on the side of the box plays `Pop Goes the Weasel` until a cute plush sock monkey pops up. The brightly colored sturdy tin box is a little over 5` tall. Ages over 18 months.